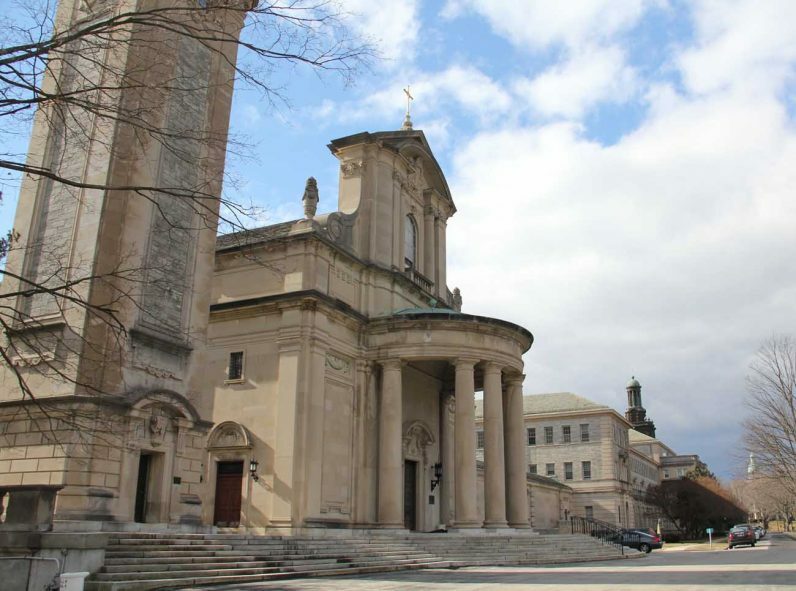 St. Charles Borromeo Seminary will begin a feasibility study with Neumann University to examine a possible future relocation of the priestly formation program from the Wynnewood, Montgomery County campus to the Catholic university in Aston, Delaware County. Administrators for the two institutions made a joint announcement Thursday, May 18 stating their intention to work exclusively on a partnership. In May 2016 Archbishop Charles Chaput accepted a recommendation that the seminary begin to look for a local partner that might host the seminary on an existing college campus. He set a one-year deadline that has been met, although the agreement does not guarantee St. Charles will relocate to Neumann. Whether the seminary’s programs will relocate to Neumann and whether the Wynnewood campus will be sold or redeveloped remain topics for the partnership to explore in coming months. No timetable for the discussions has been announced. “While this agreement does not presuppose that the seminary will definitely affiliate with Neumann, it does allow both institutions’ academic leaders and others to meet openly and to discuss how such an affiliation agreement may work to benefit both institutions,” the joint statement from the seminary and Neumann University read. 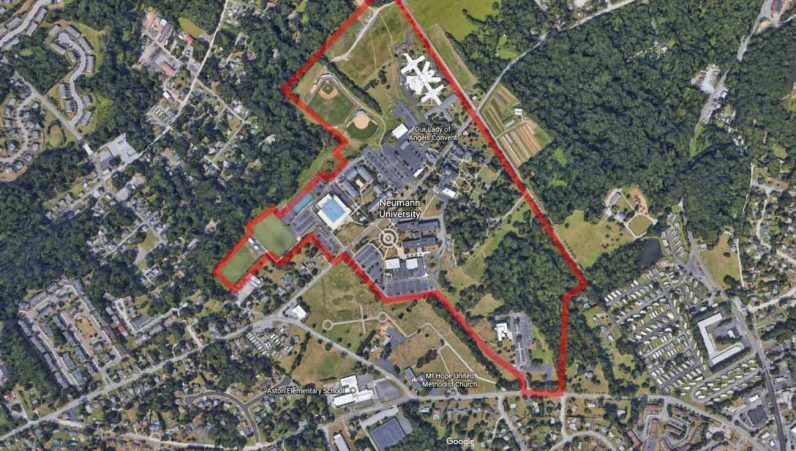 Neumann University occupies 68 acres at the edge of a densely developed residential area of Eastern Delaware County bordered by Concord and Red Hill roads. It was founded in 1965 as Our Lady of Angels College by the Franciscan Sisters of Philadelphia. Today Neumann educates almost 3,000 students and in recent years has seen growth in enrollment and construction of new student housing facilities and an athletic center named for retiring university President Rosalie Mirenda and her husband Tony. 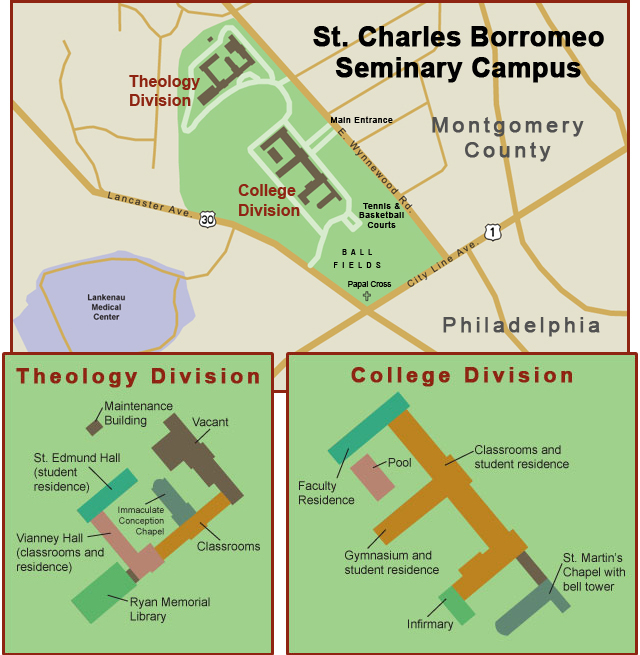 St. Charles Borromeo Seminary is much older but it has not always been located on the stately 30-acre Wynnewood campus. The seminary was founded in 1832 as the diocesan seminary by Bishop Francis Kenrick. At first it was located in the bishop’s rectory in Philadelphia then at the cathedral rectory at 18th and Race streets. Years later his successor, St, John Neumann, relocated the seminary out to a more pastoral facility in Glen Riddle, Delaware County – little more than a mile from Neumann University — before again moving the seminary in 1871 to the current location, which was then the Overbrook section of the city. In subsequent years the seminary added several large buildings including Immaculate Conception Chapel, St. Edmond’s Hall, Ryan Memorial Library and, in 1929, the massive College Division buildings featuring the cathedral-sized St. Martin’s Chapel. In the 1970s Vianney Hall was constructed for Theology Division seminarians. A proposal to merge all the seminarians on the campus into the 30-acre Theology Division buildings and sell off the 45 acres of the College Division was rejected last year by the seminary’s board of trustees as unworkable. Plans then began to explore a possible partner for the seminary, and the first step in that process, led by seminary Vice-Rector Father Patrick Welsh, has been completed with the agreement with Neumann for further study. St. Charles has seen a spike in new enrollments in the past two years, although the numbers of seminarians continues to be small in comparison to the capacity of the buildings in which the men live and study. A total of 160 seminarians are enrolled in the college and theology divisions. The seminary also educates about 300 lay and religious men and women, and men in formation for the permanent diaconate, in the School of Theological Studies. Looking to the future and letting go of the past is always the best way to move forward. Three cheers for the Philly Archdiocese! The partnership plan is a winner on all sides. My own opinion is that the entire Wynnewood Campus of the Seminary became a white elephant many years ago. It’s a mistake for the Catholic Church in today’s day and age to continue supporting and maintaining such an enormous complex of buildings for nostalgic or sentimental reasons, when the bottom line is the formation, education and training of future Priests, Deacons, Religious and Laity. I call the final goal of this whole project “getting real” and I applaud the vision that is carrying us into the future. Let’s continue to follow the guidance of the Holy Spirit, who steers us on a straight path as we continue to build up the Body of Christ in the framework of present times, always looking to the future. God bless you, Archbishop Chaput… your leadership is the shining star that brings us forward!! !